Danielle Waugh reports on the need for volunteer firefighters in rural Maine. 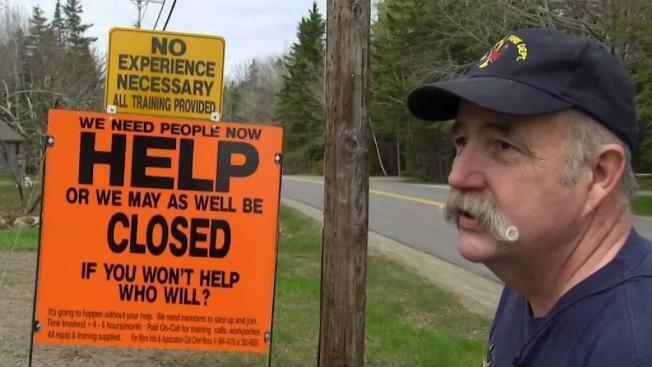 When a "Help Wanted" sign wasn't doing the job, a fire chief in midcoast Maine decided to post his plea for volunteers on a big, bold sign. "It's gotten to the point that we have to do something,” Fire Chief Frank Ross said. He helped design the sign, and says it reflects his department's urgency to recruit more volunteers. Chief Ross said he has about 17 people on staff, but very few can respond to calls during the day. On a recent accident scene, he was the only one from Owl's Head to respond. "Not good – not good," he said. "It was a real eye opener." Fire Departments across rural Maine have been aging, shrinking, and facing a challenge recruiting for years. Ross has tried other ways of getting the word out. Flyers posted around town did not generate a response. And a more dramatic sign, seemingly declaring the fire department closed, only lasted one day. "It was too much," Ross said. "The selectmen kind of asked us to change it." His latest sign seems to be striking the right tone - catching attention, and motivating recruits. "It has been phenomenal," Ross said. "We've never seen something like this." In less than a week, images of his sign have generated thousands of impressions on social media, and prompted constant phone calls from people volunteering far-and-wide. "We had a guy from Portugal, who just moved to Massachusetts, wanting to come up and help us," he said. But most promising may be the department drop-ins. Owl's Head resident Ryan Ames drove by the big sign on North Shore Road, and knew he had to stop. "I drove by a few times and said 'Wow, they need help,'" Ames said. He visited the department Friday, picked up information about volunteering, and said he planned to attend an informational meeting Monday. He said he always thought about joining the department – and he got the sign he needed.